Workshops are keeping me busy at the moment and they really are my favourite thing. When someone comes along to spin and loves it, it's the biggest buzz going. 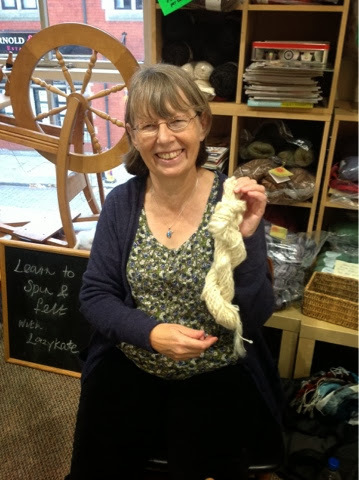 So, last Saturday at Knit Wise in Ormskirk, I met Marion Diane and Julie and we spun together for the day. 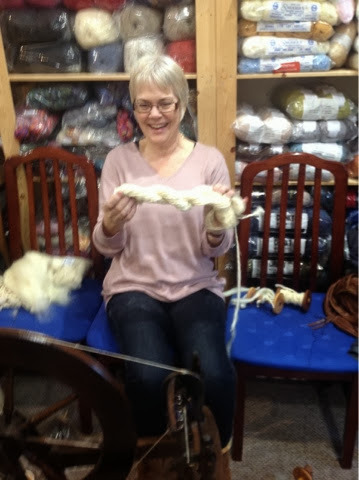 Marion and Diane had both used a drop spindle before and that is always a bonus because it introduces you to the drafting process, so they had a little bit of a head start. 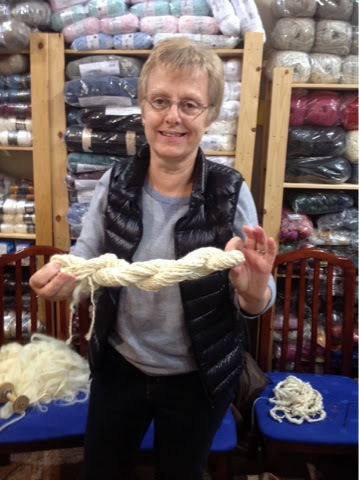 Julie had brought along her own wheel, an Ahford Traveller which is quite a quick wheel for a beginner but she did so well and by the end of the day had mastered it enough to produce a beautiful skein of yarn. It's one of the things that I try and let people know when they come to spin, that they will learn at different rates, it's easy to say but hard to convey, especially if you're the one who doesn't seem to pick it up as quickly as others but there can be many different factors that will affect your ability to learn. And some of those maybe out of your control. So, if you learn on say, a Traveller, it will be a faster wheel and may take you a little while to master it, but a Traveller is a wonderful wheel, so stick with it. We need to learn not to be so hard on ourselves, we expect so much! All the ladies were wonderful, I'm sure they'll continue with their spinning and hopefully stay in touch, I have a feeling we'll stay friends and there isn't a greater reward than that. If you're interested in Spinning Workshops, take a look at my facebook page for all the events that are going on in the near future.